Mino washi boasts a history and a tradition of more than 1,300 years and has a fine fiber texture that is highly regarded as beautiful and robust. The skill of the artisan is evident in each wonderful sheet of painstakingly formed washi. The process of making washi involves many steps, such as processing raw materials and then pressing, drying, separating and cutting. Thanks to that process, the washi is beautiful, strong and soft. Run your hand over the paper, or press it against your cheek. Its quality will be readily apparent. Come, look, experience, and touch. Try your hand at traditional paper making. 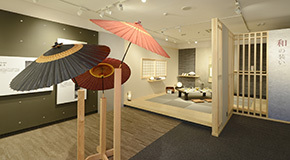 Experience the allure of Mino washi! 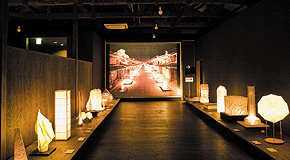 The world of candlelight art display is shown...and beckons you to a mystical candle-lit space. Lose yourself in the atmosphere created by the rows of udatsu houses at night.